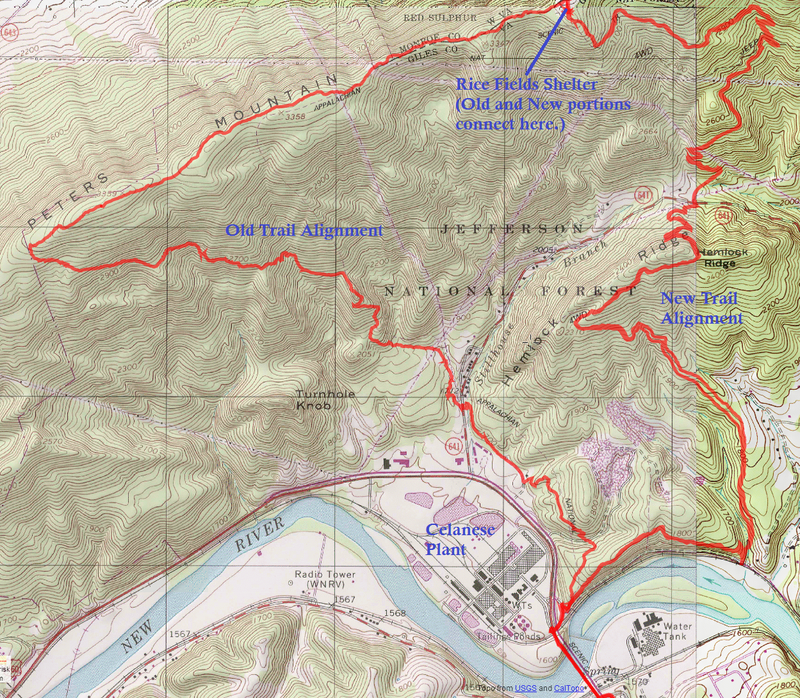 Earlier this year, the Appalachian Trail was rerouted over several miles from just north of the New River to the summit of Peters Mountain, reportedly bringing the single longest section of the A.T. still over private hands into public easements. I hiked the previous section earlier this year with my Boy Scout Troop (Link) and was left with the impression that this contained the ugliest mile of A.T. I had ever seen. News accounts of the reroute contained only vague descriptions of where the trail would go - I wanted specifics! I had made plans to join a group from the RATC to hike south of the New River on Thursday several weeks back, and it is just too far to go as a day hike. When my son's high school then scheduled its open house for Thursday night, I had to get down there on Wednesday. I planned to check out the new section Wednesday upon arrival in Pearisburg. Unfortunately, work obligations kept me from leaving as early as I would have liked, so I could not get on the trail until 5:15 PM, after a 2 hour and 40 minute commute from Charlottesville. Remembering a hike once taken where it got very dark (Link), I ditched the sunglasses and grabbed my most powerful headlamp, hoping to get as far as possible before darkness set in. The original route passed through private land owned by Celanese LLC and was "open only at their discretion." Research on a new route reportedly dates back to the 1970's. After considering several trail corridors, a single route was chosen in the early 2000's, and Congress appropriated funds in 2009 for the aquisition. Celanese eventually donated lands, so the money was used elsewhere on the trail. The ATC also received a $40,000 donation from Columbia Gas to help speed up trail completion. Upon arriving in Pearisburg, it is immediately evident what drove these donations. I remember reading that the Celanese plant was switching to natural gas power, but didn't put 2 and 2 together until I stepped out of the car. Peter's Mountain now has a big clearcut mohawk down the mountain where the natural gas line has been installed. I am glad that the new power source created the opportunity to protect the largest remaining unprotected section of trail. But I am also clear-eyed that there were definite corporate interests driving both the acquisition and the timeframe. I am pretty sure that this cut crosses the the old trail alignment in two different locations, hence the need for the re-route by Celanese. And the quicker Celanese switches to natural gas, the more quickly Columbia Gas can supply it. The old route is no longer open to hiking. And if Celanese were really "pro-A.T." I would think they would provide a couple of parking spaces at the edge of their employee lot or next to the trail access point for hikers to use, saving us dayhikers from schlepping over the New River Bridge from the only available parking area. Reports indicate that anyone trying to park on that side of the river will get chased away pretty quick. Nevertheless, this is a pretty big deal for the ATC, which oversees the trail as a whole. There is a nice article about the re-route in the ATC's magazine (link), and hiking colleagues at the Roanoke Appalachian Trail Club have helped with new trail construction for a long time. Here is a rundown of the trail, from South to North, since I have not found a guide online anywhere else. Impressions follow, and photos and a map are at the end of this post. 0.0 miles. I parked at the Giles County Agricultural Cooperative parking lot in Bluff City (the old Wade's Grocery location), walked under U.S. 460 and took the pedestrian crossing on the Shumate Bridge over the New River that constitutes the A.T.
0.5 miles. After a half mile roadside walk, the A.T. heads down some concrete steps, passes under 460, and enters the woods at the same place it entered before the re-route. The new trail diverges from the old route not more than 100 yards off the road, hugging a ridge over the New River and Norfolk Southern Railway. There are no views along here, though. The trail is very wide and level - clearly laid out using a small bulldozer. 1.6 miles. After about another mile, the trail switchbacks a couple of times before crossing a small creek and a dirt road. Signs in either direction state that the water in this stream is non-potable, and you do not want to mess with that! It comes down from an area that is the "Celco Industrial Landfill," according to the sign we passed when hiking the original trail alignment. Your Sawyer mini isn't going to help you with that stuff! After crossing the dirt road, the trail begins an ascent lasting nearly two miles, at about a 9 percent grade. 2.0 miles. There is a small overlook here with views to the east, along with a prominent sign indicating private property. To the left, the trail passes by the edge of the Celco Landfill for the next 3/10 of a mile, with a buffer of about 50 feet of planted pine trees generally obscuring views. 3.0 miles. The trail turns from generally north west to northeast as it continues to climb Hemlock Ridge. 3.5 miles. The trail crests Hemlock Ridge, having ascended 910 feet from the stream crossing, and then heads back down through a series of switchbacks - some in rhododendron groves. 4.1 miles. After a series of switchbacks, the A.T. descends to Clendennin Road. It crosses the road and heads up a USFS road called the Pocahontas Road. There is a stream passing under the Pocahontas Road here. This is the first safe water I have seen on the hike, but I would wait to obtain water until higher up the mountain, if possible. I looked for parking here, but did not see any area clearly reserved for parking on either road. 4.3 miles. The trail breaks from the dirt Pocahontas Road, heading up the mountain over a series of wooden steps. I am told that the trail past this point has been complete for much longer than the portion I just completed, as the trail planners have been working on this section in advance of final readiness of the entire segment. This makes sense, since the trail is on National Forest property after crossing Clendennin Road, according to the boundary signs. Over the next few miles the trail passes over much stonework, sometimes elaborate, and this stonework is very nicely done. 4.6 miles. The last of 3 switchbacks. 5.0 miles. The trail passes under a power line, giving a nice view to the east. 5.2 miles. After a consistent 500 foot ascent at a 9 percent grade over nearly one mile, the trail turns right at a campsite and follows a woods road for a short distance, dropping a small amount of elevation. Fresh tire tracks tell me that this road is still used. 5.3 miles. The trail takes a sharp left over some very nicely constructed stone steps. The trail is considerably rockier here, but many rocks have been used to construct steps. I believe these trail portions have been constructed over a relatively long period of time. 5.7 miles. The trail crosses the first of several springs after a couple of switchbacks. 6.3 miles. Another spring. Both springs were flowing in mid-August when I hiked the trail. 6.4 miles. The trail takes a sharp right here and begins a steep climb. The trees crowd the trail here before the trail merges onto another old dirt road. 6.6 miles. The trail comes out behind the Rice Fields Shelter, and I believe the last portion of the trail uses the Rice Fields Shelter's water trail, back to the second spring I passed at 6.3 miles. I was sure surprised that this is where the re-routed trail links up with the existing A.T. Behind the Rice Fields Shelter is the single most exposed privy I've ever seen on the A.T. It is basically a wooden platform that is shielded from the shelter by a sheet of plywood. The privy is open to the world in every other direction. One of those directions is the new A.T. route. So now using this privy risks having exposure to any other hiker on the trail! Ugh. 6.7 miles. The trail passes right next to the Rice Fields Shelter. It took me 2 hours and 10 minutes to complete this trail section from the New River Bridge to the Rice Fields Shelter. I talked at the shelter with a section hiker named "No Regrets" who was heading north. Then I turned around and worked on my trail running muscles, intent on covering as much trail as I could before sunlight faded. I made it back to the landfill before the headlamp was on full time. It took me 1 hour and 37 minutes to return, but I did not keep running after sunlight disappeared. So how do the alignments compare? The new route is certainly less ugly than the old one was. Crunching the numbers, my data indicates that new route is also 4/10ths of a mile shorter from the New River to the Rice Field Shelter. The new route also has about 80 feet less of a climb. And difficulty formula grades out at 225.9 for the old route and 192.8 for the new one, making the new route easier, at least mathematically. While one friend told me that he liked the old route better, I think I favor the new route. Total Time: 4 hours, 1 minute, including stops. Steepest Uphill: from 6.4 miles to 6.6 miles; 22.2% average grade. Average elevation gain: 7.9% up Hemlock Ridge, 9.7% up Peters Mountain. Old and new alignments compared on a topo map. Mile 0.5: View of the Celanese Plant from just before the trail enters the woods. Note the clearcut line down the mountain to the right - the alignment for the natural gas line. Mile 1.6: Trail crosses stream with prominent warning signs. Mile 2.0: The Celanese landfill is to the left of the trail here, separated by a cyclone fence. Mile 4.3: The trail ascends from Pocahontas Road on a series of wooden steps. Mile 5.0: The trail passes under a power line cut, which provides a view to the east. Mile 5.3: the Trail takes a sharp left off of the dirt road (shown here on the left) to continue its ascent. just behind the privy. The shelter is behind the privy and to the left in this photo. Like what you see? Check out my other blog postings! LINK. Thanks for a great blog. Wish I'd seen it before missing the turn while heading sobo on Peters Mtn. There is nothing on the trail to indicate it turns at Rice Field shelter, and the AT journeys article is not helpful on this point. There's parking on Clendennin Road and Pocahontas Road. Both are side of the road pullouts. Clendennin fits a couple vehicles. It's east of the AT and the pullout is on the left side of the road. Pocahantas fits 3 vehicles. It's just up on the right past where the AT veers left off of the road. Both areas had hikers parked there today. This so helpful. There are no signs on Clendennin road. We drove up an down there this afternoon looking for the AT. Thank you for this! We used your detailed overview this past week and had a delightful hike. And good news --- the composting privy is now totally enclosed! Good news indeed! I'll have to get down there and check it out again.